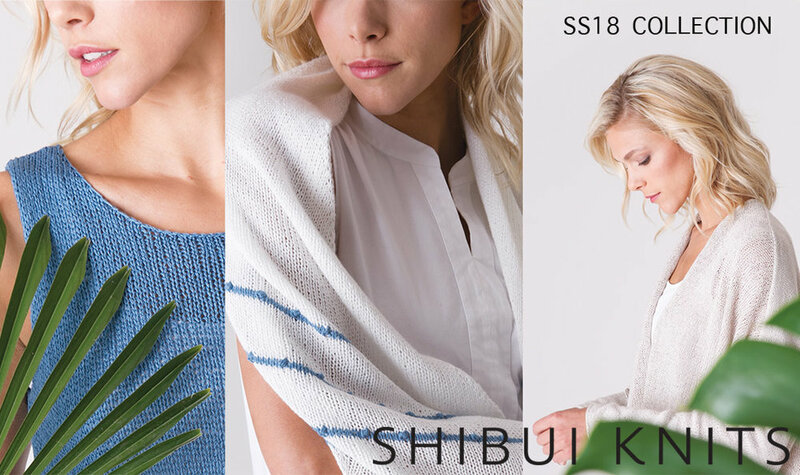 Shibui Knits launched their Spring/Summer 2018 collection on March 8, and Spun will have these beautiful designs in the shop April 10-23. The collection highlights their newest yarn, Fern, a cable-plied sport weight that’s been brushed for a matte finish and a downy halo. Fern marks another elegant addition to Shibui’s unparalleled collection of season-spanning yarns. For the SS18 collection, Shellie Anderson has created a stunning slate of of eight designs for the new season that take full advantage of the wide range of fabrics created by mixing different Shibui bases. "Zephyr," an oversized cardigan knit in Fern and Twig, features innovative construction to ensure an elegant fit. "Mirage" is a classic shell with optional short sleeves knit from the bottom up in Fern and Silk Cloud, featuring classic A-line shaping and sheer Silk Cloud panels that flutter at the hem, contrasting with the shell. "Oasis," which comes free with the purchase of appropriate Shibui yarn, is knit on the bias, the body of the scarf worked in stockinette, nupps punctuating stripes of color at both ends. Check out the entire collection here, and make sure to stop by when we have it on display.